Anna looked at the straw in her hand. It was half the size of the ones held by her older brother and sister. “Great,” she muttered as they hooted and poked each other jubilantly – suddenly twelve again instead of grown with children of their own. “Hey sis, the attic is all yours. Watch for rabid bats!” Ryan teased. It was good to see them laughing and joking. Anything that helped them get through clearing out their childhood home without an emotional breakdown was welcome. Anna climbed the rickety ladder to the attic. As she cautiously poked her head through the opening, she cursed her brother under her breath. Rabid bats and other unwelcome guests hadn’t even occurred to her. “Thanks, big brother!” she mumbled. When nothing but dust moved in the hot air for several minutes, she decided the attic was either unoccupied or its furry tenants were busy elsewhere. A few more rungs and she was fully in the attic, trying not to think of asbestos and God-knows-what other toxins floating in the stale air. “Thank God Mom wasn’t a pack rat,” she thought to herself. The attic only had a few boxes, which were all neatly labeled and stacked. The first box was labeled “Ryan.” Anna wasn’t surprised to find that the contents were special mementos specific to her brother – her mother had always been very organized, down to planning the details of her own funeral. For a few moments she entertained herself by going through pictures and other items that had distinguished themselves enough to be placed in the attic box. Some of the pictures were unfamiliar. A small boy with sandy blond hair on a tricycle bore no resemblance to the pre-teen that was her earliest memory of Ryan. 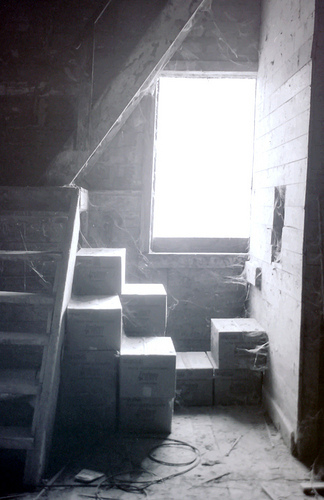 Anna moved the box closer to the attic door and moved on to the next box, which was labeled with Parker’s name. Opening the box revealed a collection of items similar to Ryan’s, and also included pictures of her sister that had been taken several years before Anna had been born. Grinning, she stuffed the picture of a three or four-year-old Parker standing naked in a sprinkler into her pocket for future blackmailing purposes. For a moment, she nearly skipped the box labeled “Anna,” but curiosity got the better of her. She pulled the box toward her and opened it. The letter inside this envelope is from your birth mother. I know you said you weren’t interested in knowing anything about her – you had all the family you needed - but I saved it in case you changed your mind someday. I believe God always meant for us to be a family. You were our daughter the moment we saw you. But loving us doesn’t mean you can’t be curious about the woman who gave you life and made our family complete, even if you never meet her. It’s your decision. No matter what you decide – always know we are proud of you. Anna was still staring at the envelope when Ryan and Parker came looking for her, eager to regale her with tales of the mutant spider in the garage. This post is a response to a prompt from The Red Dress Club to write about our character finding a forgotten letter from someone in their past. As always, thank you for stopping by and reading - your comments and critiques are very welcome! What a moving take on this week's prompt! I love the interaction between the brother and sisters; their love and affection for one another is apparent. As is the love from their Mom. Just the neatly stacked and labeled boxes spoke of her love to me, but then that bittersweet letter...very obviously a loving mother. I just wonder what Anna will choose to do? Lovely story! I especially love your title. Stopping by from TRDC. Oh wow- LOVE this take, the ending, the twist. You words drew me in- snickered, rickety, rungs- but the characters are relatable and the karate chop ending? Perfection! Katie - Thanks! I have no idea what Anna will do - I'm fascinated by how our thoughts and ideas change as we experience life. Those things that seemed set in stone start shifting! I'm glad you liked the title! "I believe God always meant for us to be a family. You were our daughter the moment we saw you. But loving us doesn’t mean you can’t be curious about the woman who gave you life and made our family complete, even if you never meet her." Thank you Valerie! Years ago my mom and dad made clear to me that if I ever wanted to meet my birth mother they knew it didn't mean I loved them less. I never really had that need, but I've known people who have. Umph! I'm an adoptive mom. This one hit me in the tummy. Great surprise ending. I'm with Galin, I love your description of the attic. And naked sprinkler pictures--who doens't haven't those? Honest Convo - my mom has pics of me standing naked in a plastic tub that was otherwise used for washing dishes. Camping pictures=awesome blackmail material! I don't have a letter from my birth mother - but my mom does have a letter from my foster mother. It gets pulled out and read about once every ten years or so...usually around a big event like graduating high school, getting married, having kids. You portrayed the relationships between siblings perfectly and made it funny. The letter was so moving. Nicely done!